Fancy meeting you here again! I hope the week has treated you well. We are crossing our fingers for snow this weekend. Well, my kids are crossing their fingers. I’m a little more ambivalent about it since I’m secretly longing for spring now that Christmas is over. However, I stocked up on eggs, bread and milk because isn’t that what you are supposed to do with a storm on the way? This week I shared a tutorial for how to cinch in the waistband of your jeans without using a sewing machine. If you missed it, don’t expect a picture of the final product on my body. There are some things I can’t take pictures of and post on the internet. And in keeping with my ‘jack of all trades, master of none’ mantra I shared some basketball practice outlines if you happen to be the lucky duck who is coaching 4, 5 or 6-year-old children. If not, you’re the lucky duck who gets to read today’s Happy List and that’s almost as good in my book. Well, this is about the neatest thing I’ve ever seen! 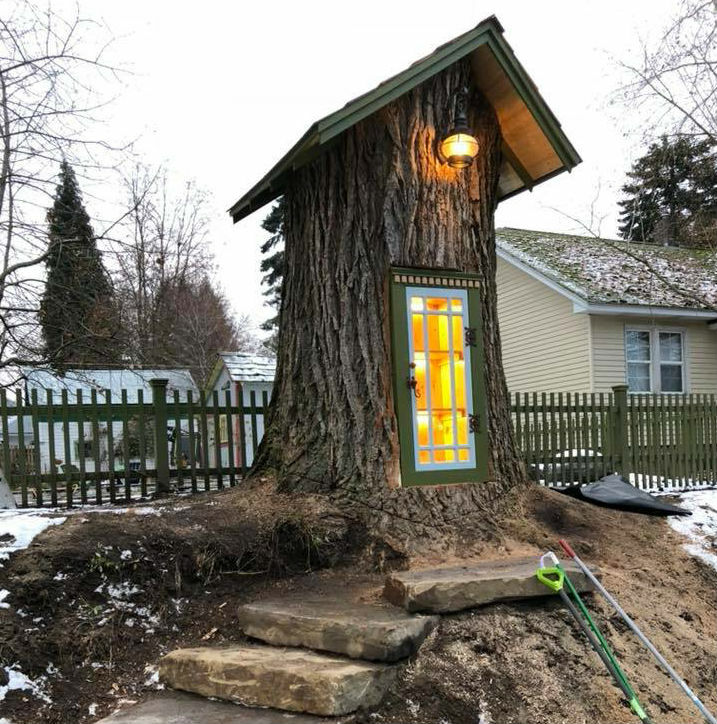 Sharalee Armitage Howard made this Little Free Library from a tree stump at her home in Idaho. The dentil moulding at the top is actually carved books! Go to Little Free Library to see more pictures of this neat library and to find one near you. If you’ve ever thought about converting a garage into an AirBnB space, let this conversion by The Handmade Home be your guide! CAN YOU DRINK WINE OUT OF A PRINGLES CAN? You might have seen the news that a woman was found drinking wine from a Pringles can while driving an electric shopping cart around a Walmart parking lot at 6:30 in the morning. For the record, it wasn’t me. I’m sure if you go beyond the funny details of that story, it will become very sad, very quickly. So let’s focus on the ingenuity of drinking wine from a Pringles can. Something that I have never done or considered doing. I have sipped wine from a water bottle in a park in Berlin. I’m not sure I should have confessed that though. One writer from Food and Wine magazine decide to find out if the Pringles can theory was even possible. Please read the story because it is very funny and not unkind to the woman who was found doing this. P.S. On a separate note, no one tell Handy Husband there are dill pickle-flavored Pringles now. Did you see this video last week? The helicopter pilot is so matter-of-fact about this rescue maneuver, but DANG! I don’t think I could have played it so cool if I had just done this daring rescue. Stair walls always seem tricky, so I like to see ideas of how people make those walls work for them. 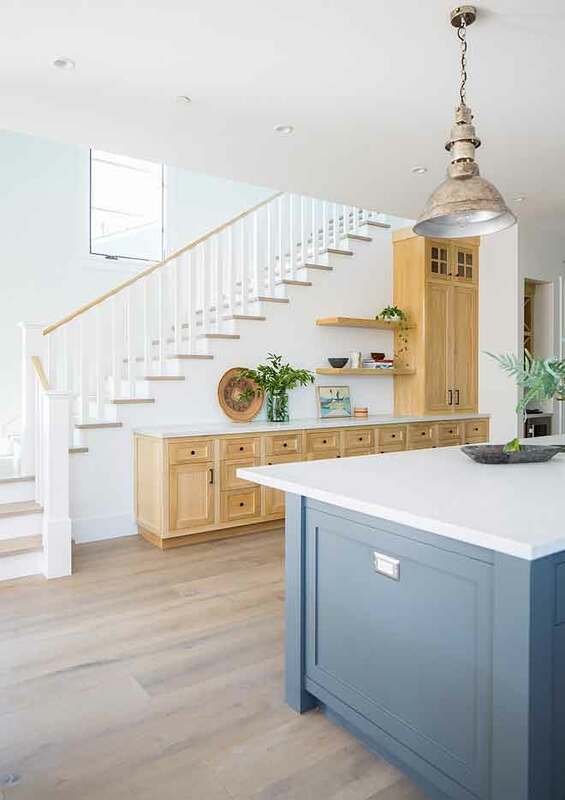 This picture is from a beach house featured on Home Bunch. The rooftop terrace of this house is amazing, by the way. I wouldn’t mind living someplace where a rooftop terrace made sense. If you’re looking for a long sleeve t-shirt that makes it look like you put some effort into getting dressed, let me recommend this Zattcas shirt from Amazon. Most of the time I’m highly disappointed by my Amazon clothing purchases. You just never know what you’re going to get. However! I have been wearing this shirt on constant repeat since Christmas. It’s about $20. I ordered the large in the heather blue color (I’m 5’9″ and a size 8). It’s blousy on me like the picture shows, but fits in the shoulders and arms. It also has a nice pleat detail in the back, which gives it an upgrade over a usual t-shirt. Most of you could probably wear the shirt with leggings unless you are tall and super long-waisted like I am. Around Thanksgiving I had Bibimbap for the first time at a restaurant in New York. I couldn’t even pronounce the word, but the dish was delicious! 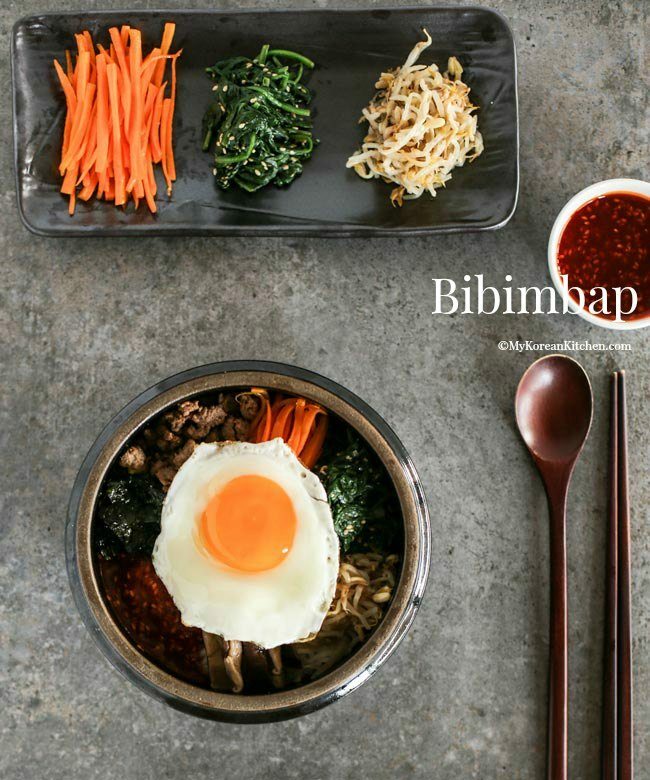 Bibimbap is a Korean dish with rice, meat and vegetables all mixed together with a fried egg. I haven’t stopped thinking about it, so I’ve been periodically checking out recipes and this one from My Korean Kitchen seems delicious and the most doable. Should I try it? If I know myself, I will probably wait until we have guests coming to test it out. HAHAHA! Google is having a ‘doodle for Google’ contest for kids in grades K – 12. Homeschool kids can enter too. Prizes include scholarships, tech money for schools, Google swag, etc. The computer teacher at my son’s school let us know about this contest. My kids are really into it and yours might be as well. For more information on rules, deadlines, etc. click here. It’s not often that home photos make me pet my screen, but this one…WOW! Have you ever seen a brick ceiling? In a home? How do they even do that? There’s a lot going on in this world we live in, so thank you for taking the time to spend part of your day with me. *Affiliate product links were included in this post. I get credit when you buy something from one of my links and it doesn’t cost you anything extra. Big hugs and thanks!